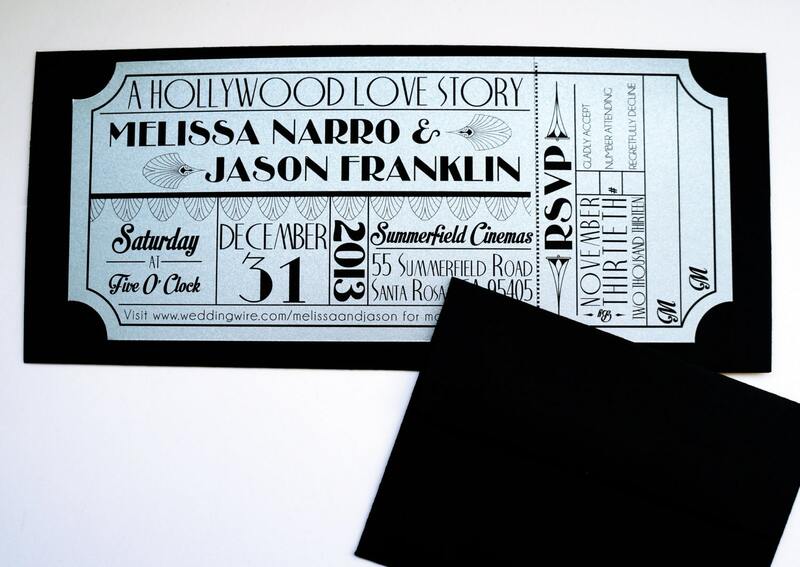 This unique invitation is made to look like a vintage old hollywood movie ticket or theatre ticket with an art deco theme. Printed on a very thick 105lb metallic silver cover stock and with a tear-away RSVP, this invitation is bound to leave your wedding guests stunned and thrilled for the wedding of a lifetime. This invitation is a high quality print on super thick 105lb metallic silver cover stock. The corners of the invitation are cut to give the realistic look of a movie ticket. The RSVP portion of the invitation is perforated for easy tearing so it may be mailed back to the bride and groom. Receiving this invitation will be so fun to for your guests. Being able to tear their own ticket stub will make it feel like a real movie ticket and get them into the spirit of your wedding. This listing is for a SAMPLE of the following invitation. This will allow you to see the high quality of the print, cover stock and envelopes; so you know for certain that this is the wedding invitation for you. The wording of the sample you receive is random. This sample invitation ships FREE in the United States! Beautiful, and very good quality. All of my guests have loved these invitations! Worth every penny! After your invitations have been purchased, you will receive a design proof via email. Once a design proof has been approved, production of your invitations/cards will begin immediately. **Once you have approved your proof, you are now fully responsible for the design** If there is a misprint, misspelling, design flaw, etc. found after you have received your invitations or cards, this is your responsibility. I may be able to help with a re-print discount but am not responsible for reprinting or refunding your items. All items ship with USPS unless specified otherwise. Bright-Eyed Birdie it not responsible for additional International taxes or tariffs imposed at customs. Items marked as "free shipping" do not include tracking. If interested in upgrading your shipping to include tracking, please specify when checking out.